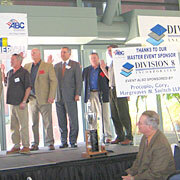 In addition to adding to the business community as leaders of the Associated Builders and Contractors of America and Associated General Contractors of America, Division 8 is involved in our local community, as well as a wide variety of charitable and civic organizations. We contribute on a yearly basis to the Cystic Fibrosis Foundation, Rady Children’s Hospital Foundation, California State Sheriff’s Association, San Diego State University Aztec’s Parents Association, Blue Ribbon Coalition, Habitat for Humanity, Good Will, Disabled American Veterans, Salvation Army, Father Joe Carroll’s St. Vincent de Paul Village, as well as several youth sports organizations. We believe in building hope, as well.